Scientists from The Australian National University (ANU) and overseas have discovered the oldest colours in the geological record, 1.1 billion-year-old bright pink pigments extracted from rocks deep beneath the Sahara desert in Africa. Dr Nur Gueneli from ANU said the pigments taken from marine black shales of the Taoudeni Basin in Mauritania, West Africa, were more than half a billion years older than previous pigment discoveries. Dr Gueneli discovered the molecules as part of her PhD studies. “The bright pink pigments are the molecular fossils of chlorophyll that were produced by ancient photosynthetic organisms inhabiting an ancient ocean that has long since vanished,” said Dr Gueneli from the ANU Research School of Earth Sciences. ANU led the research with support from Geoscience Australia and researchers in the United States and Japan. The researchers crushed the billion-year-old rocks to powder, before extracting and analysing molecules of ancient organisms from them. “The precise analysis of the ancient pigments confirmed that tiny cyanobacteria dominated the base of the food chain in the oceans a billion years ago, which helps to explain why animals did not exist at the time,” Dr Gueneli said. “Algae, although still microscopic, are a thousand times larger in volume than cyanobacteria, and are a much richer food source,” said Dr Brocks from the ANU Research School of Earth Sciences. 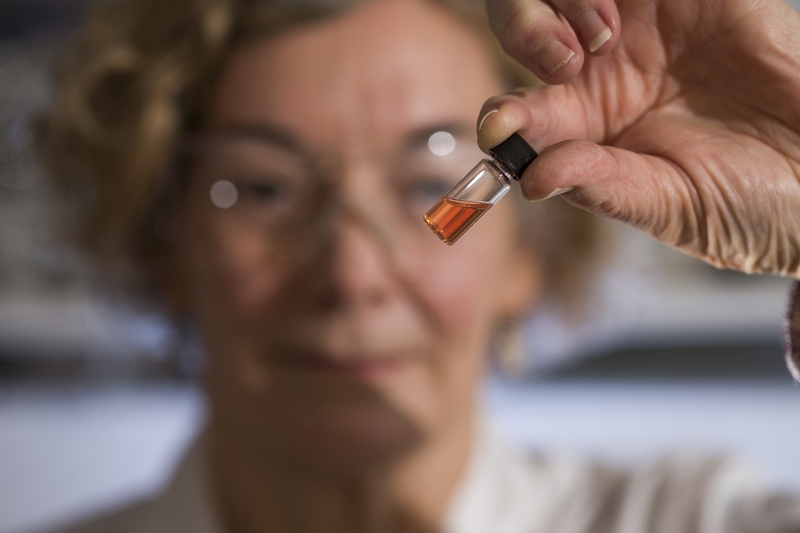 * Caption for images: Biogeochemistry Lab Manager Janet Hope from the ANU Research School of Earth Sciences holds a vial of pink coloured porphyrins representing the oldest intact pigments in the world. Image credit: The Australian National University. For media assistance, contact Will Wright on +61 2 6100 3486, the ANU media hotline on +612 6125 7979 or email the ANU Media Team at media@anu.edu.au.